Immoths are large elementals of ice, making their home in the coldest parts of the material plane. 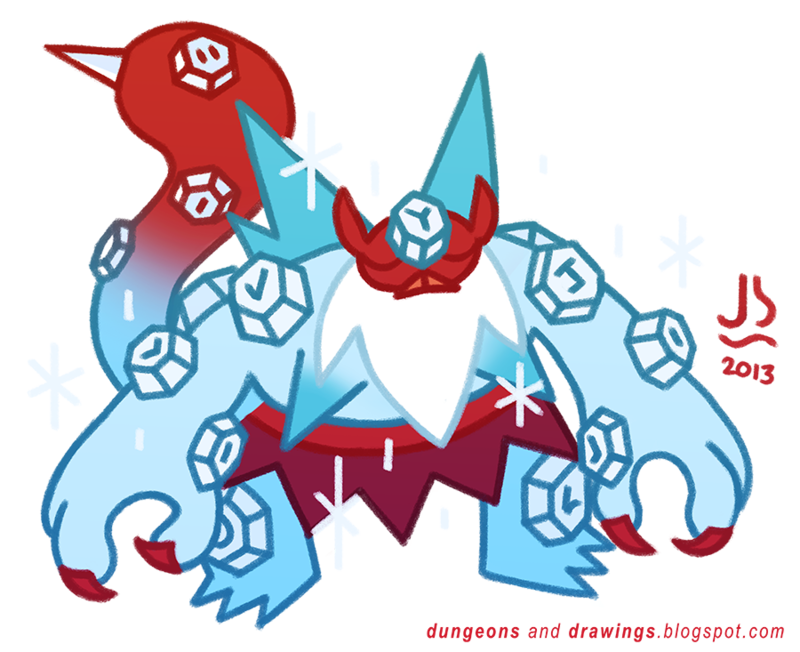 Their dense flesh makes them difficult to damage and their bodies are encrusted with magic runes, whose powers they are able to unleash at will. It is said that Immoths inscribe these runes themselves as they travel from place to place. They are famously curious, possessing a deep hunger for information of all kinds, and barter (and some times fight) to obtain it. There is a legend that Immoths are recipients of some ancient information-gathering curse, forcing them to compulsively travel and learn. If this is true, it is thought the magic runes on their bodies started as a way to remember things. This week's monsters are a kind of new idea - Blanca and I both chose monsters for each other to illustrate, and we didn't look at any existing images of our creatures. I think it helped me think outside the box a little more, so we're thinking of trying it again. Anyway, enjoy! The only thing worse that getting a bat stuck in your hair is when said bat is on fire. If you're familiar with the Zelda series, you know how annoying a fire bat can get. Like the Salamander, Rast and Efreet, the Fire Bat is a creature native to the Elemental Plane of Fire. They normally appear as winged bitey fireballs and reveal their more bat-like nature when their fire is extinguished (normally on death). At first you might think that the Fire Bat is your pretty standard fire-based creature. 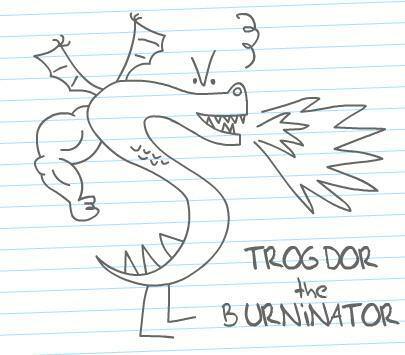 If it touches you, it burns, capable of setting things on fire, etc... But it also has a pretty interesting ability. These fellas are voracious flesh eaters. Their strategy is to bite someone, keep their teeth in until they've eaten their fill and then fly away. 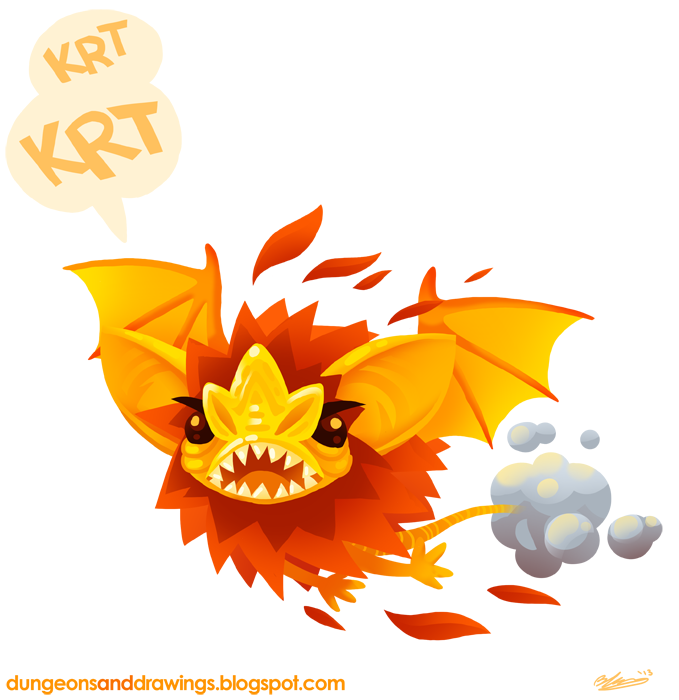 However, where a fire bat gets full, it has a change to split into two fire bats. Both of which are hungry. Just carry a bucket of water with you. They don't like water. The Zaratan is an almost-legendary creature of the sea. There are islands that people get stranded on, but the island moves. It moves so slowly that the people on it don't realize that they're on a turtle instead of on land. This animal, while large and potentially dangerous, is also slow and lazy. It prefers to float on the surface of the water with its mouth open, letting fish fly into its gullet. The creature can't be actively directed like a ship or horse, but a musician may play certain songs that excite the giant turtle out of its ordinary stupor. It's uncertain whether these turtles are their own species or ordinary turtles who have grown over millenia. No young ones have ever been found. The beast-landmass is a very well-trod trope in stories. It's usually a combination of the size and slowness of the creature. 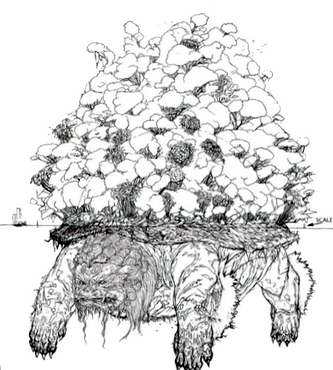 A titan, whale, giant turtle or other creature will be asleep for long enough (or simply slow enough) for vegetation to begin growing on its body. 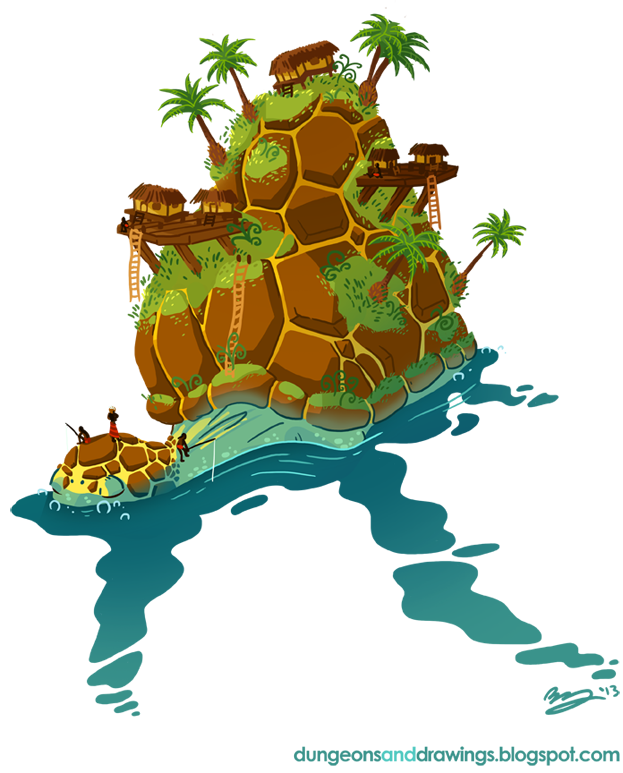 People unsuspectingly walk on or even inhabit the island before they realize they're on a living creature. This trope first appears in the legends and folktales of ancient sea-faring cultures. 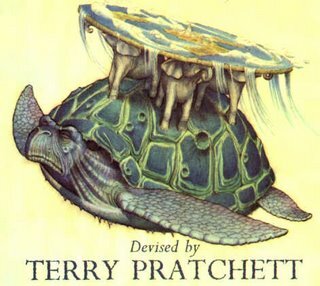 Today, you can see this played out in the Discworld book series, Pokémon, Shadow of the Colossus, Avatar the Last Airbender and probably a ton of other entertainment. The Zaratan itself appears in Jose Luis Borges' The Book of Imaginary Beings. Beedle had been ready to run the moment he saw it move. Seasoned treasure-hunter or no, a gnome is wise to observe discretion over valour when, in the act of raiding some dead god's temple, he sees what appears to be a broad statue of bolted black metal shift its weight and come alive! Legging it out of the temple with a small sack-full of gold, he nevertheless considered the day well-spent. It was the following night that he realised things would not go so smoothly. Awoken by an odd sound on the wind, he peered from his tent to note - with horror - that the statue had followed him! Rather than attacking him it simply stood, observing him with an unfaltering gaze. At first, Beedle had made the obvious assumption that it was some avenging demon, set in place by its masters to protect their treasure. But the thing did not seem the least bit interested in the gold. It seemed rather to simply appreciate his company, and it followed him wherever he went. Whatever it was, it certainly had the gnomish spirit of adventure! It wasn't the slightest bit afraid of trespassing in ancient tombs and temples. And it was handy in a fight, too - the thing could pop a goblin's head off like a corked bottle! 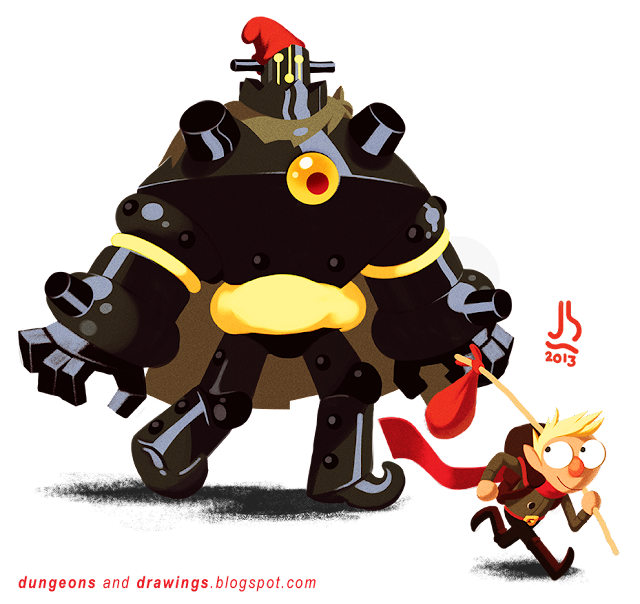 The hat and cape were Beedle's idea, but he had a feeling the golem didn't mind. This would be the beginning of a beautiful friendship. Zodars are pretty cool! A construct of unknown origin (no cop-out "a-wizard-made-it" backstory here; it's completely open), basically a shell of black metal filled with weird muscle-goo that can puff up to become strength 50 for a turn. For a medium-sized humanoid this is pretty crazy - but the interesting stuff is in the additional details. Firstly, Zodars are actually capable of altering reality with a Wish spell once per year (although, the book tells us, they rarely deign to do so). Also, despite not having an intelligence score, they are capable of speech, although a Zodar is not likely to speak more than a sentence in a human's lifetime. And get this - when they do speak, every creature that hears it understands it regardless of what languages they know. Weird, huh? Also the armour Zodars are clad in is presumably some mysterious dimension X material because they are literally invulnerable to all damage except by bludgeoning weapons. They sound sort of eccentric, too - apparently they occasionally travel around with adventuring groups on an enigmatic whim. The book sets it up that they're moved to do so by strange profound force but I like the idea that they just find adventuring fun. The Yeth Hound is one of many breeds of hellish dog. 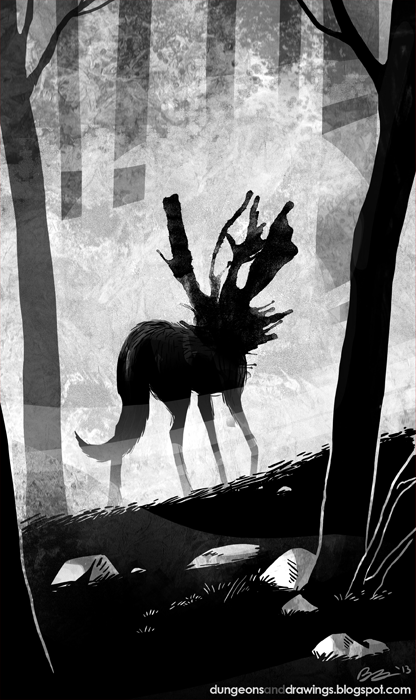 Packs of these slim headless hounts can be found in grey wastelands and barren moors, hunting unfortunate lost souls. The howl of the Yeth Hound is its greatest weapon and strikes fear into the hearts of those who hear before they even see it. The best protection against these creatures is light; they fear and hate light, and fade away to nothing in the sun's rays. The mythology of the yeth hound is a lot more interesting than the illustration in the Monster Manual would have you believe. They appear in the folklore of the British Isles, being described as the Devil's headless hunting hounds. Other sources say that the yeth hound is the spirit of an unbaptized child. The Isles have a good deal of legends involving ghostly dogs and large cats prowling along the moors. They also go by the name of yell hound, wish hound or whist hound. Their cry is both terrifying and mournful. So it's kind of a shame that since the Yeth Hound is a headless dog, the official illustration is of a dog with a vaguely humanoid face. Especially since there's already plenty of other kinds of hellhounds and beastly canines among the monsters of D&D. Their native plane is also quite interesting. The Gray Wastes of Hades are a plane of neutral evil, located between Hell and the Abyss, and is used as the main battleground between devils and demons. It seems to be the opposite of the Blessed Fields of Elysium. Where Elysium is colourful, warm and euphoric, Hades is pale, cold and depressing. Like Elysium, it can alter the mood of those who live in it, this time by making you as morose and apathetic that you can't find the energy with which to leave. The plane drains you of colour and substance, until you become a translucent shade. Also, try to find The Drolls, Traditions and Superstitions of Old Cornwall by Robert Hunt. It's an older book (1881), so it may be difficult to get a hold of. But it tells lots of neat stories of giant, fairies, ghosts and demons that haunt the English countryside, and its where I got my Yeth Hound info from. 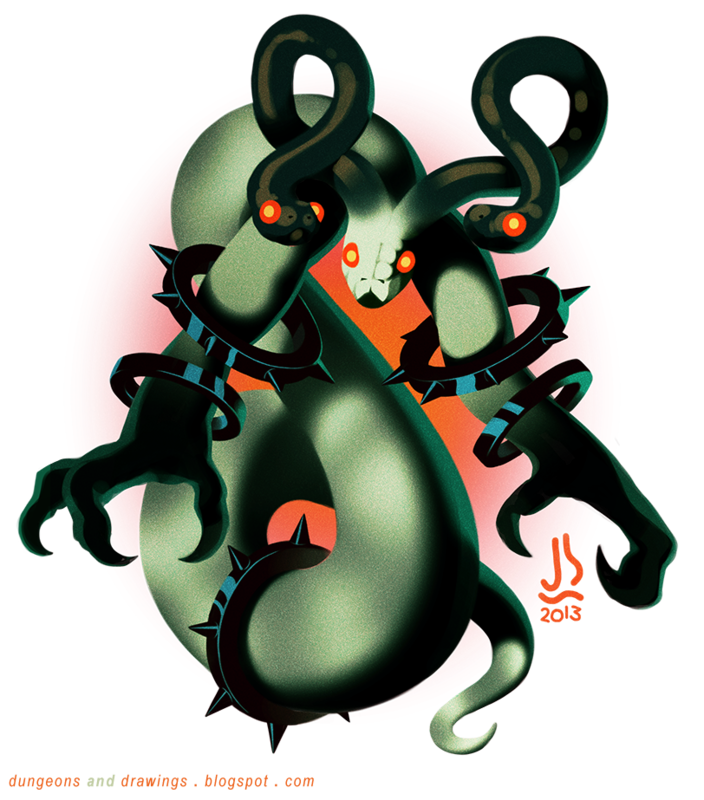 The Xerfilstyx, also known by its more comfortable name of Styx Devil, is one of the natural residents of the River Styx, a long trail of oily blood-like water that runs through all the Lower Plains. Due to the river's length, it's possible to encounter this creature in Hades, Carceri, the Abyss, Pandemoium... but it will be a far more common sight in its native dimension, the Nine Hell. The creature itself is of great size, resembling a cross between a horned man and a slug, with large wings and a great deal of exsanguinating suckers on its tail. It's difficult to say whether its home in the River Styx mean it's immune to it, or constantly under its power. The Styx has memory-wiping properties and even dipping a finger in it can cause the erasure of hours of your life. Complete immersion would leave you a blank slate as your memories are washed down the river. The Styx Devil is insane, possessing few, if any, of its own memories, and temporary keeper to the memories of countless souls as they wash over it. But in its dark heart the devil doesn't feel torture or grief at the absence of self, but joy in enlightenment. And it wants to share this joy with everyone. The Xerfilstyx is an extremely powerful creature. Its constant subjugation by the waters of its own home probably prevent it from rising up and challenging the Lords of Hell. It has a great number of powerful spells, both protective and offensive. The tail is an appendage to be avoided; once its suckers attach to a person, the devil begins to drain both blood and memories. The stolen blood can be heated through the creature's hellish veins, mixed with the Styx waters and regurgitates on other unfortunates in a spray of boiling gore and forgetfulness. Interesting note: the River Styx of the D&D cosmology is more alike to the River Lethe of Greek mythology. This was one of five rivers in Hades, all with different properties. Lethe is forgetfulness, Styx is hatred, Acheron is pain, Phlegethon is a river of fire and Cocytus is lamentation (possibly a river of tears). The Styx in mythology is the largest and most important (gods would swear on the Styx, since the goddess that represented it was considered honorable and true). Strangely, Charon the Ferryman doesn't even transport souls across the Styx; he does it over the Acheron. Maybe the threat of the painful waters dissuades any souls with cold feet from jumping in and swimming back to the living world. Xerfilstyx's appearance influenced by the Glaucus atlanticus, also known as the blue dragon sea slug, an incredibly beautiful creature.